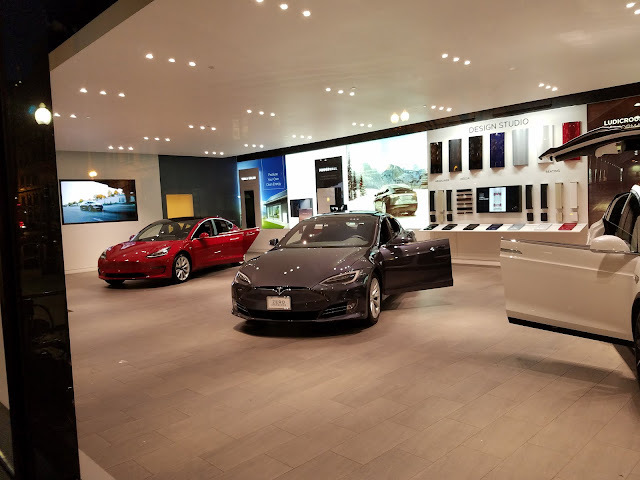 Tesla showroom in Washington D.C.
Tesla Inc.has asked some suppliers to refund a portion of what the electric-car company has spent previously, an appeal that reflects the auto maker’s urgency to sustain operations during a critical production period, reports The Wall Street Journal. The company said it is asking its suppliers for cash back to help it become profitable, according to a memo reviewed by the Journal that was sent to a supplier last week. Tesla requested the supplier return what it calls a meaningful amount of money of its payments since 2016, according to the memo. If they are going to do this sort of thing they are running the risk of finding themselves fired as a customer from suppliers that don't need Tesla Motors to stay in business. Guess Musk never learned not to be the customer that is 2% of the business and 80% of the hassle. Odd that Musk would ask for cash from suppliers, when he's used the state to force taxpayers to help fund his business. I guess he finds the supplier lobby to be more powerful than the taxpayer lobby.